Light, warm, and user friendly! Extra fiber fill in just the right places. Unique stuff compression sack allows it to fit well in bottom section of pack. Down warmth with fiber fill under hips and shoulders help keep loft. Same as most lightweight bags, zipper flap gets caught sometimes. This is one of the best bags I've owned. Lightweight, warm down fill is supported by fiber fill in the typical compression spots (hips, shoulders, feet). Comfort range is great; from snow to stars, it keeps you comfortable. The unique stuff/compression sack is such that when utilized properly compresses bag in to sort of a U-shaped football that fits well in the lower storage pocket of my Osprey by "curving" around my waist. You can spend more, but unless you're planning on sub-0, no tent weather this bag is truly an "all season" bag. Bought this North Face bag at a local REI. I used it for several years in a variety of settings, from indoor use to summer hiking, fall, even some winter hikes. My biggest complaint is its temp rating. My bag says it is a 15-degree rating. YES, I always stored it loose, never compressed. The bag was well taken care of. After several nights over several different outings I was sure to bring extra clothes to sleep in if I knew temps would drop below freezing. 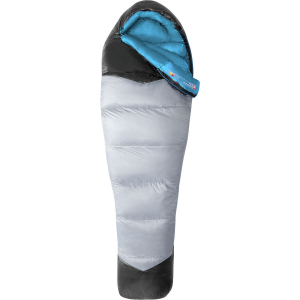 This sleeping bag left me unimpressed. There are also feathers leaking out at a constant slow "drip". Besides being lightweight and being nice to look at, not much good I can say about it. Welcome to Trailspace, Troy. Thanks for sharing your experience with this bag. I purchased my Blue Kazoo in 1986 (yes, almost 29 years ago) and have used it, on average, 10 nights a year for backpacking. It has failed to keep me warm only once while winter camping in the Rockies when temps dipped outside my tent to about -10°F. The only minor hassle I've had with this bag is that the zipper frequently catches the draft collar; perhaps the newer design improves on the ease of zipping. It packs into a fairly small (6-1/2" x 14") stuff sack (my regular size Kazoo weighs a true 3# 2oz), and lofts quickly when removed. I use my gear, but treat it well — this bag has returned the favor. Tim, welcome to Trailspace, and thanks for sharing a review on your well-tested bag. This is a fantastic, lightweight bag for backpacking and general camping. I've had my Blue Kazoo for over 20 years, and it has never let me down. 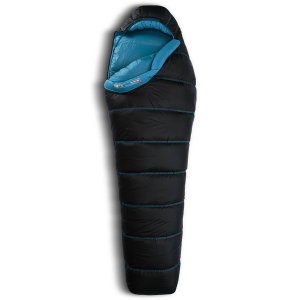 I now let my 7-yr-old son use this when we camp, and it kept him cozy and asleep in 40 degree temps even after rolling off of his Therm-a-Rest pad. As I have gotten older (bigger around the waist), the bag has gotten a little more snug, but I'm 6' and 240 lbs., so your mileage may vary. (I was 6', 170 lbs. when I bought this.) It still fits me fine, but I do get a little claustrophobic in this now, especially in the foot bed. I have two other North Face bags, and they zip together. I am about to mail this bag to NF's warranty repair, as they have changed their standard zipper in the last 20 years, and this bag is not compatible. They will replace the zipper for free and return the bag to me at no cost (other than my initial postage). Overall, this has been one of my best camping purchases in my lifetime. It has stood the test of time, never let me down on chilly nights, and has become somewhat of an heirloom that I can hand down to my boy now that he is a scout. I recommend this bag without hesitation to anyone looking for a lightweight, easy to pack, and warm bag! Welcome to Trailspace, Rob! Thanks for sharing your Blue Kazoo review. I always enjoy hearing about gear people have been using for many years, and even passed down. Glad to hear your bag has held up so well. I'd love to see some pics, if you're willing to share them in your review. Good bag, true to temp rating, excellent durability. Good bag, true to temp rating, excellent durability. Would take it anywhere. The Blue Kazoo is a great bag. I can't say that I have a strong basis of comparison because I have been using the same Blue Kazoo since college 10 years ago. I believe it is true to its 20-degree rating and I have taken it much lower than that by wearing clothes and using a tent and sleeping pad. To attest to its durability, not only have I stuffed it in my pack on numerous treks, and used it to crash on couches, it it was my actual bed for an entire year and a half. I washed it recently using Nikwax and restored its loft to about 95% of original. It's like having a new bag again. I've had this bag for over 11 years now. Doesn't have the loft it used to, but it's still warm. I find it's very versatile. Mine doesn't have closed baffles front to back so for summer camping I'll shake the down so that most of it is on the back of the bag. When things start getting cold, I'll shake the bag so more of the down is on the front of the bag. In those 11 years I've grown a bit, and now the bag is starting to feel a little cramped, but when it's really cold out it doesn't feel cramped at all. It's been a great value for the money! Good bag for three season camping. Long bag has plenty room for a 6'1", 180 pound guy. Kept me warm well below freezing (I'm a warm sleeper). Nice quality for a mid-priced bag. I was very happy with my Blue Kazoo bag. It has kept me warm so far even in below freezing temps. I love the fact that it has a remarkable price tag as well. I used it up in the Sierras and woke up to about a foot and a half of snow and still was not cold. I would not have been so open to buying the bag if it was not on sale, but I must admit it holds a lot of qualities that a more expensive bag would have. My only complaint is that it seems to shed a lot of feathers but that's not enough to keep me from using it. This bag rocks!!! I used it on a backpacking trip to Revelstoke and kept me warm at -5C/25F and I'm a cold sleeper. I have the 2003 model so not sure how the new ones fair - but coming from TNF I would expect exceptional quality, reasonable price, and really light weight. Don't leave home without this bag. Used it with the Rock 22 tent and had a comfortable sleep. You get what you pay for, and this bag is the best! Far too hot for BC coast for me. Feathers started coming out right after I bought it. Feels cramped and restrictive. I am 5 ft 5" and average weight. I have the Blue Kazoo 20. Still going on 5 years with no bad issues. Is losing some feathers. Very durable. AT thru hiked in 2002 and used it for 50% of trip from 17 degrees to 70 degrees. Two items are not perfect. The main zipper sometimes gets stuck in the zipper cover fabric. The other is that it could use a little more knee space for us fetal sleepers. I'm 5'11" and 210 pounds. The bag was cramped for me. Big problem with cold spots due to the down shifting. Fidgety zipper. Snagged and actually came open several times in the middle of the night. Do yourself a favor, take a pass on this bag. It's not up to TNF's usual high quality standards. As it is expected from TNF, this bag is superbly well built. The temp rating seems accurate and it packs extremely small and actually fits my 4000cu/in frame pack that I own. I don't have much luck with this sleeping bag. The first one was a defect and got replaced. The second one looked OK but then found feather leaking never stops. Both ones came with lot of dust. Pros: it does keep me warm at +30F, and it's very light and can be compressed into very small pack. It dries quickly even though it gets wet easily. Cons: getting wet too easily despite of the "water-resistant" top shell, every morning I found wet spot here and there from the tent condensation. Feather leaks too much. Not rugged structure, feather moves among cells after one wash (hand wash), now one cell is completely empty and the other one is half empty. My wife's Igloo doesn't have this problem after the same wash. I have a TNF down parka for 10 years, used it extensively and washed every year (didn't have Nikwax down wash until this year, just used normal detergent, even dry cleaning once). Never had any problem and it always keeps me warm. That's why I bought this TNF sleeping bag. However, I must say I am disappointed and TNF's quality definitely is going down. At 6'2" 240lbs this bag is a little cramped. However, it was my first love. Over the past five years it has performed well in all temperatures -- though it had some trouble keeping me warm when the temperature dipped below freezing (feet got cold), despite its +20F rating. Recommended for medium to large builds. If you wear XL clothing, you'll find it a bit restraining. Will work in sub 32F in a pinch. 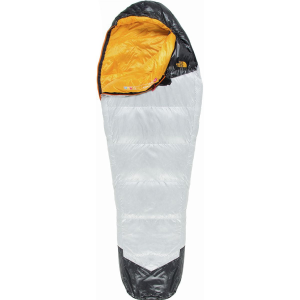 This is a nice down bag at a reasonable price. I have had it for about six months now and it doesn't have any damage yet. This bag is comfortable and roomy to sleep in. On the downside, this bag has been losing some feathers while I am bpacking, but this does not bother me much. Another issue is condensation on tent walls, when will it ever end. (If there is a tent out there without this problem, let me know.) This is a good bag and I recommend it. 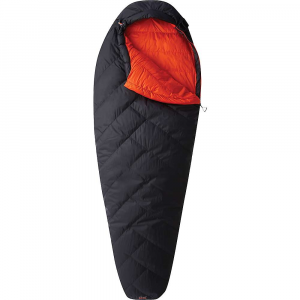 Great sleeping bag, comfortable and warm...alarm holder and good support for your head. A good backpacking bag, reasonable cost vs packed size and weight. 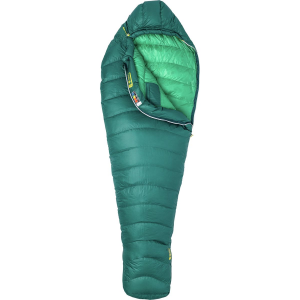 My only real complaints are: the zipper sometimes hangs up, the 20 deg F rating is too low for me even though I don't consider myself a cold sleeper, and the occasional escaping feather. Even with these complaints, I would recommend it. Used this bag in Arizona and New Mexico, where it is 100 degrees during the day and 40 degrees at night. I was very impressed with the performance of this bag--well worth the (kind of) high price tag. This bag is crap if you plan to go mountaineering. This bag is crap if you plan to go mountaineering. The condensation inside the tent compresses all of the down and then all of the down will start to come out. It did however do its job by keeping me warm though; but I don't know how long it's going to last.